Jay G, resident dj at Party107.com and host of the past D.U.T.C.H. Radio shows, has come with a new monthly tranceshow 'Hopes & Miracles'. "The show 'Hopes & Miracles' is focused on love and peace, which embody the goodness of trance... and life. By this show, I want to strenghten you in the way that you really are, and that... is Perfect." 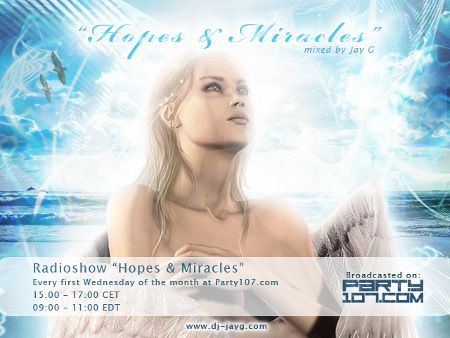 'Hopes & Miracles' is a monthly show airing on the first Wednesday of the month featuring two hours of Jay G in the mix. Catch the next episode on Wednesday the 3rd of June 2009! The show starts at 9:00 AM Eastern / 6:00 AM Pacific / 15:00 CET / 2:00 PM UK. Do you want to talk about hopes or/and miracles in your life? Please, share it on http://www.dj-jayg.com and find also more information about the show, podcasts, tracklists and Jay G.